BDCW ULTIMATE Skid Plates continue to be the top choice of expert riders, proving its worth in the most rigorous conditions and terrain worldwide. Think you don’t need this much protection? Think again. It’s while learning to master big bike skills, both on pavement and off-road, that carnage happens. Rocks get kicked up, bikes get dropped and hung up, curbs get in the way, and scrapes and spills are just part of the adventure. And the ULTIMATE Skid Plate is designed to take all of the abuse—and more. BDCW ULTIMATE Skid Plate for the Honda Africa Twin CRF1000L is truly the ULTIMATE solution for protecting your new ride. We are offering TWO versions—one that is compatible with the center stands and the other is not compatible with a center stand, BUT provides extra coverage that protects the rear suspension linkage. We didn't just make one plate and add a separate add on piece (and charge your more for it), we made it out of one piece of strong aluminum. More than stout! Taking full advantage of the frame cradle on the Africa Twin, our skid plate closely follows the contour of the frame, providing optimal support and making it one of THE most robust skid plates available. When combined with the BDCW Lower Engine Bars and Hepco Becker Tank Guards, you will be ready for any adventure! 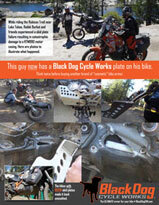 Africa Twin skid plate w/center stand is compatible with the Honda OEM, Hepco Becker and SW-Motech center stands. Please call us to determine fitment with any other center stands you do not find listed here. Designed to work with the Black Dog Lower Engine Bars, NOT compatible with any other aftermarket bars. Compatible with the Arrow header pipe. NOT compatible with the Remus header Please contact us if your aftermarket header is not currently listed. NOT compatible with the DCT foot shifter. Our plate covers engine case, header pipes, ignition cover and clutch cover as well as the rear suspension linkage (for non-center stand versions). Remove the stock skid plate, install the rear bracket and bolt the skid plate on—15 minutes TOP. No disassembly of major components required. We have used a steel mounting bracket at the rear of the bike. This is not some lightweight rear bracket to support the skid plate—our parts are made to take a beating. You get what you pay for. And we found the optimal material to protect, perform, and last. In fact, it may very well outlive your bike. The grade of aluminum we selected is designed to ABSORB impacts, not transfer the force to the mounting points on the bike. No holes to snag on rocks or branches. This plate glides on its own—right up over most obstacles without bolts, rubber glides or rivets to catch or break. Other skid plates leave this expensive component ($700+) exposed to damage. Protects the mounting points and maximizes ground clearance. Only 2 bolts to remove/reinstall for maintenance with our unique key slot design. Designed to maximize clearance while keeping the profile as narrow as possible to avoid obstacles and still provide the ultimate protection. No other skid plate offers protection of this vital component all in one piece. No additional costs of an add on part that bolts to your plate. Removes with just 2 bolts for an oil change! No disassembly required. Looks great and takes the punishment that anodized finishes can’t. Not that it matters when it’s covered in mud. Unique cut out of the continent of Africa sets this one apart and screams "adventure." Considering the costs of expensive repairs or “extractions” from the outback, it’s a bargain! No bones about it, we manufacture all of our Black Dog products right here in the U.S. It is extremely important to us. We have world class manufacturers in our own back yard and we intend to use them. All of our own products are rigorously tested on our personal bikes BEFORE they’re released. Our innovative and rugged designs are used throughout the world—a fact that we’re very proud of. We make no pretense that we’re the cheapest, but, you can be sure that BDCW products are the best made, and that we stand behind them. Check out what satisfied BDCW customers and industry editors and experts are saying. We are confident that if you decide to go with a Black Dog product, and that you'll be pleased. But don’t take our word for it, ask one of the MANY adventure motorcycle industry leaders who could run any equipment they wanted—you'll find the vast majority run with BLACK DOG. There's a reason for that. BDCW's Kurt Forget discusses his crash in Baja—how the bike's armor held up, and how the Klim Badlands suit and Krios helmet performed their jobs perfectly.